Ever wish you could just fly off and leave everything behind? Now imagine you’re a teen who actually can fly her own plane, only she’s stuck doing the bidding of two teen brothers who may not have the best intentions. 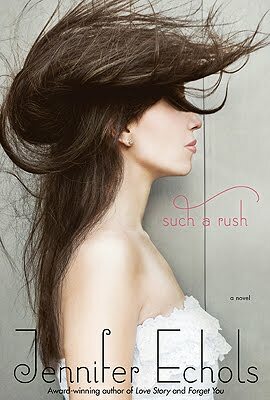 That’s the intriguing concept behind GCC member Jennifer Echols’s fun new book, SUCH A RUSH, published this month through MTV Books. But Mr. Hall’s teenage sons, golden boy Alec and adrenaline junkie Grayson, are determined to keep the banner planes flying. Though Leah has crushed on Grayson for years, she’s leery of getting involved in what now seems like a doomed business–until Grayson betrays her by digging up her most damning secret. Holding it over her head, he forces her to fly for secret reasons of his own, reasons involving Alec. Now Leah finds herself drawn into a battle between brothers–and the consequences could be deadly. Jennifer: None of the characters are based on real people, but I have a lot of experience with pilots and small-town airports. My father is a private pilot who got his license when I was five years old, so I’ve spent a lot of time hanging out in a corrugated metal hangar and flying over the countryside. Jennifer: We were on a family vacation at the beach when my dad decided to go to the airport and watch planes take off and land, which is something he does regularly when the family vacation gets to be too much! My son and I went with him, and we sat in rocking chairs on the front porch of the airport office, watching the advertising banner planes take off, snag their banners, drop their banners, and land again. The whole process looks alarming and dangerous, and when my dad told me these pilots tend to be very young because they’re amassing hours to become airline pilots someday, I knew that was my next YA novel. Jennifer: This is my fourth novel in this genre with the same publisher, so we were just going back to contract. The negotiations went on and on over lots of phone conversations. In the end, we were able to sign a hardcover deal. I think the book is beautiful and I couldn’t be more pleased with how the images turned out.